Are you a New Dad? Tell Us Your Thoughts Today! We're excited to partner with the fine folks over at What To Expect, the experts on all things mom and pregnancy. 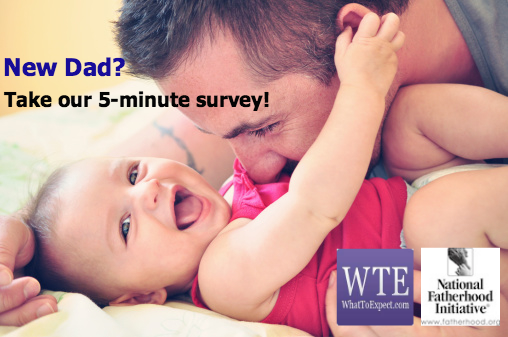 We are conducting a survey about pregnancy and baby's first year. We've heard from the moms, now we want to hear from the dads! If you're a new dad or dad-to-be, please take a moment to respond to a few questions. All of the opinions will be revealed soon in brand new infographic in partnership with the wonderful folks over at What to Expect. Don't worry, dads, we won't use names or faces for with your honest answers! Questions on the survey range from number of children to asking about thoughts to questions like—well—we can't say too much or we'll mess up the survey. Just go take it, please!